Below you can view all the homes for sale in the Chandler Pond subdivision located in Lawrenceville Georgia. 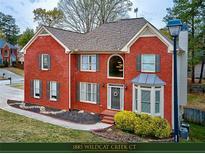 Listings in Chandler Pond are updated daily from data we receive from the Atlanta multiple listing service. To learn more about any of these homes or to receive custom notifications when a new property is listed for sale in Chandler Pond, give us a call at 404-998-4113. Don'T Let This One Pass By! MLS#6537193. Main Source Realty, Llc.. Custom Mud Room, 5 Inch Plank White Oak Hardwood Flooring On Entire Main & 2nd Floor, Over-Sized Deck W/Metal Balusters & Privacy Fenced Yard. MLS#6533889. Remax Legends. Priced To Allow For Updates To Suit Your Personal Taste. MLS#6531693. Keller Williams Realty Atlanta Partners. Upstairs Master Suite, Four Bedrooms,3rd Full Bath And Laundry. MLS#6531204. Mark Spain Real Estate. Come And Check It Out Yourself!!! Must See!! ! MLS#6528818. First United Realty Of Ga, Inc..
Swim/Tennis Community And Lake To Enjoy! MLS#6526579. Keller Williams Realty Atl Part. Perfect For In Law/Teen Suite* New Carpet, Paint & Appliances* Screened Porch, Deck & Large Patio*Tons Of Storage*This One Has It All-No Need To Preview*Cul-De-Sac*Sought After Schools*Owners Transferring. MLS#6515769. Keller Williams Realty Atlanta Partners. Updated 4-Bedroom,3-Bath Beautiful Family Home With Gorgeous Open Floor Plan, Stunning New Hardwood Floors Throughout Main, Gourmet Kitchen With Granite Counters, New Stainless Steel Appliances Joined To Breakfast Area With View Of Huge Vaulted Fireside Family Room And Tranquil Backyard, Elegant Master Suite Features Hardwood Floors, Double Vanity, Jacuzzi Tub,And Walking Closet.Two Story Foyer Flanked By Formal Living And Dining Room, Guest Bedroom With Full Bath On Main,Full Basement Ready To Be Finished,Freshly Painted,Swim/Tennis Community W/Lake.Great Schools MLS#6115698. Solid Source Realty Ga, Llc..